Even Tennessee winters are long and it's a time for dreaming up canoe trips. My partner on a previous trip decided he wanted to go beyond the tree line into the Canadian Barrens. After many emails and research, it became clear that changes in the exchange rate and the price of gas made such a trip a budget buster. Wait til next year! We returned to our idea of going north of WCPP. We'd get flown into Artery L., see the pictographs and then wend our way north and west through a series of lakes and rivers for a pickup at Rheaume Lake where we had been a couple of years before. But he hurt a rib planting trees and that trip had to be postponed. 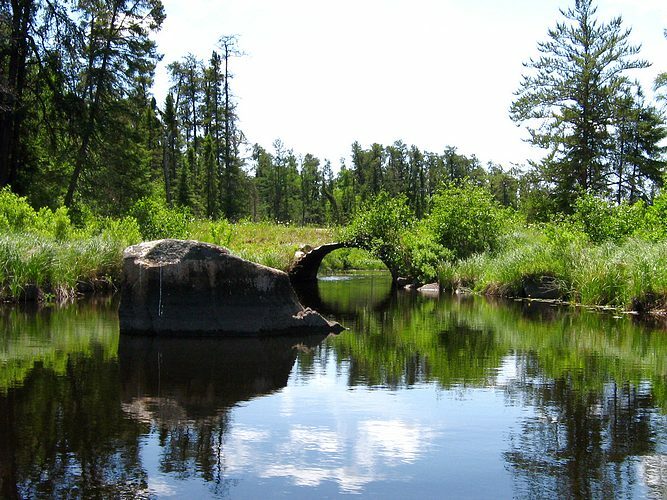 So the summer stretched in front of me and I realized that I had the time to go to the BWCA. But where to go? Sometimes I think I have a 19 year-old mind living in a 58 year-old body because when I look in Beymer's book I'm attracted to the routes he rates as "Most rugged". Rarely visited areas appeal to me, as do poorly maintained portage trails. I should be looking for the "Easy" routes and the flat and graveled trails. But no. My 91 year-old mother's health was also a variable. She had recently been in the hospital and seemed weak so I couldn't make long range plans. I noticed that E.P. 's south of the Echo Trail (Moose R. South, Big Lake) were regularly available and saw that I could make a loop starting there, going through familiar territory in the LISR and then looping back through lakes north of the Echo Trail. 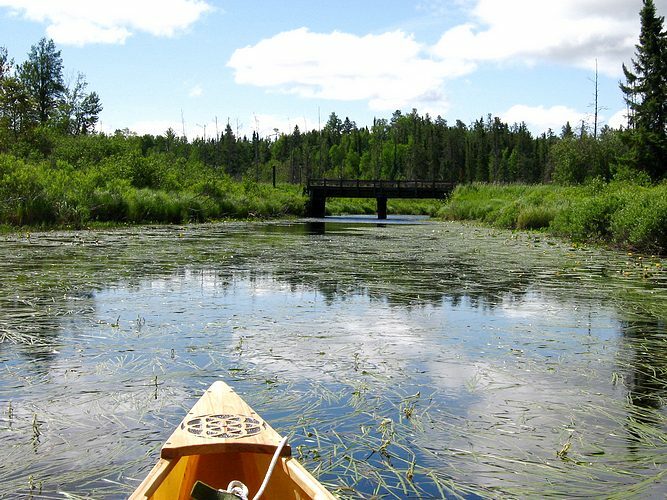 The teenaged mind liked the 2-mile "poorly maintained" trail out of Big Moose L. and the "numerous" beaver dams on the upper LISR that would "hinder rapid progress." My mother seemed stronger and my wife said, "You better get out of here before something else happens." So I made my reservation and took off a few days later. On previous trips I was carrying too much stuff. The 58 part of me cried out for a lighter load. I did some reading on ultralight backpacking and bought some new lightweight gear. Some examples: instead of my 6 lb. Timberline tent, I bought a 20 oz. "Brawny" (no longer available), 6 lb. Bag and Thermo-Rest became 3 lb. Big Agnes inflatable mat and bag, a 2 oz. Alcohol stove replaced a 13 oz. Whisperlite stove. I also got a lighter pair of binocs and camera. So my essentials were less than 20 lbs. Food and other extras (raingear, jacket, birdbook, GPS, etc) got it up to around 30. Another saga was the canoe. I had built a wooden stripper but it weighed in at 64 lbs. But using it as a mold I was able to make a Kevlar copy that weighed 28. Actually it took two attempts to achieve this weight. The first try ended up with a 15 lb. Kevlar boat that, while very light, bent in half when picked up. Adding more Kevlar and S-Glass to stiffen it brought the weight up to 41still too heavy. A generous soul volunteered to buy it for the price of materials. I used this money to fund the second attempt. I used strips of Kevlar instead of whole sheets and this proved to be a good balance between strength and weight. For portaging I used a light aluminum telescoping rod and a tumpline. Much lighter than the 7-lb yoke I had used before and, in keeping with ultralight philosophy of using the same thing for different purposes, the rod also became my tent pole at night. The canoe seat was a piece of 3 inch Minicell that adjusted the trim by attaching to strips of Velcro that I epoxied to the bottom of the canoe and was easily removed for use as a camp chair. So when all of this was applied to my shoulders it was a little over 60#. Not light, but less than other trips. The above-mentioned generous soul lived on the way from Tennessee to Ely and we made arrangements for me to meet him and deliver the canoe. So I left on a solo trip with 2 solo canoes on my Tundra. The long drive north was proceeding smoothly through the endless Illinois cornfields went the bow rope suddenly broke and the soon to be delivered canoe blew off and started dragging along the interstate at 70 mph. By the time I stopped it had bent and made a hole in one side and broken the gunwales on both sides. At first I though I would have to leave it on the side on the road and refund the money, but I realized that I could simply turn it around and have the bad end downwind. This accident was entirely preventable. First, I knew it could happen. On another trip, in my friend's Tundra, the bow rope broke where we had tied it to a towhook under the engine. So I had applied duct tape to it but a guy at the local garage had said that a piece of "hose pipe" (as they say in Tennessee) would work better. I ignored the advice. So I stopped off in Madison to meet the Generous Soul and let him at least see the canoe (which has too many cosmetic flaws to mention). It was great meeting him and his wife. Being a generous soul, he didn't want his money back. We agreed that I would keep the canoe, repair it and discuss how to get it to him later. So on to Ely via Two Harbors and highway 2 through the trees. I met Lynn, who I "know" from the canoe country bulletin board, at Voyageurs North, bought a map, got my permit. I spent the night at the Paddle Inn where a friendly Lab greeted me as I signed in. The couple in the next room was heading up the LISR where I would be in 3 days. We planned to look for each other. I headed out early the next morning. The weather kept changing, clear, foggy, then misty, then clear again--all in about 30 min. I checked out a couple of entry points on the Echo Trail. Stuart R. was busy and had several cars in the lot. Big Lake was deserted with only one car in the lot. Moose R. south also had only one car. But my mind was on Moose R. North (that is, my teenage mind) because I thought it was possible to put in there but go south on the Moose R. to the South E.P. 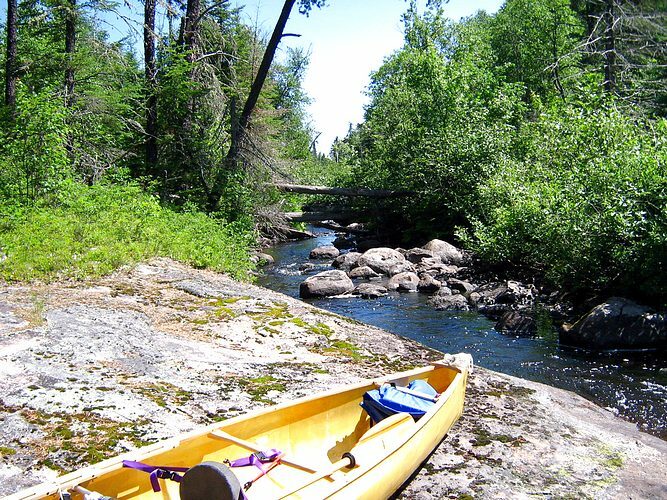 This was an area not officially in the BWCA. A ranger had told me that only "locals" used it and John at Voyageurs North had said it was "rough." (This excited the teenager.) At the Moose R. North E.P. things were busy. Many cars were in the lot, several with multi-canoe trailers and a couple of groups were getting organized to start the initial 160 r. portage. I wanted to avoid crowds and decided to drive back toward the Echo Trail and see if I saw a way to get to the Moose River. I had noticed a little narrow road heading that way and I drove down it. It came out at some high rocks above the rapids. No crowds here. The way appeared clear to the South. So I unloaded my stuff and parked my car in the lot and walked back. Here's my stuff at the top of rock (a small cliff really) before I got it down to the river. So I headed upstream (south). Everything was great. A sunny day and a small river with plenty of water all to myself. But in literally 5 minutes this changed. I went around a bend and rapids appeared with no obvious portage trail. I had been advised by someone to just leave my stuff by the side of the Echo Trail, park at the Moose R. N. parking lot and hike back. This advice would come back to me several times until I reached the Echo T. I carried my pack first and scouted out a route through brush and across wet moss-covered rocks. 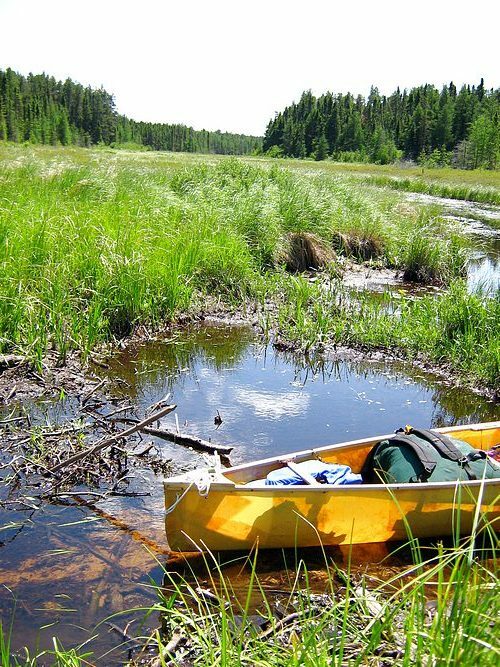 Then I gingerly carried the canoe until the creek became passable. I had noticed a sign at the E.P. that described the trail there as 18" wide, graveled and 62" of clearance. No sign here; but I realized this was the true wilderness experience. This was the way the whole area was before the fur trade and the logging boom. I decided to never complain about a portage trail again because at least there was one. Here's the first "rapid." I tried to always step on dry rocks but it wasn't always possible. 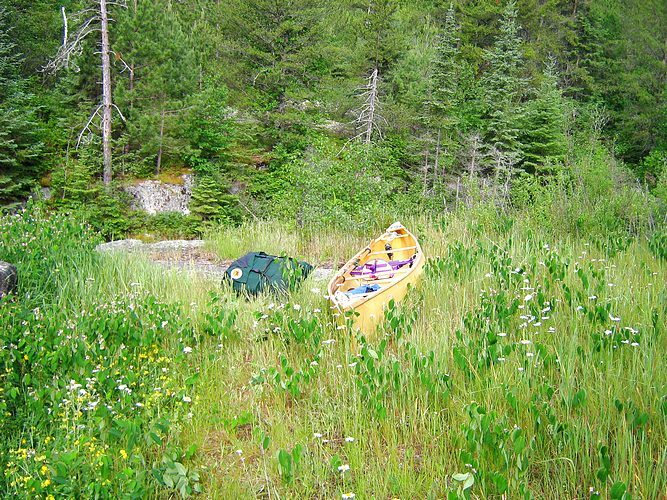 It was impossible to carry the canoe through the brush on either side of the river. On one trip I saw a bird bathing and I thought, "This is great I'm really experiencing the wilderness and I'm going to get close to an unusual bird (for me at least). But it turned out to be a robin. It turned out there were 2 more rapids between the Echo and the official Moose R. S. E.P. (MRSEP). This one had the added attraction of a deadfall blocking the whole river. I had my GPS (Garmin GPS Map 60C) going all of this time and used it like an electronic diary to chart my (slow) progress. 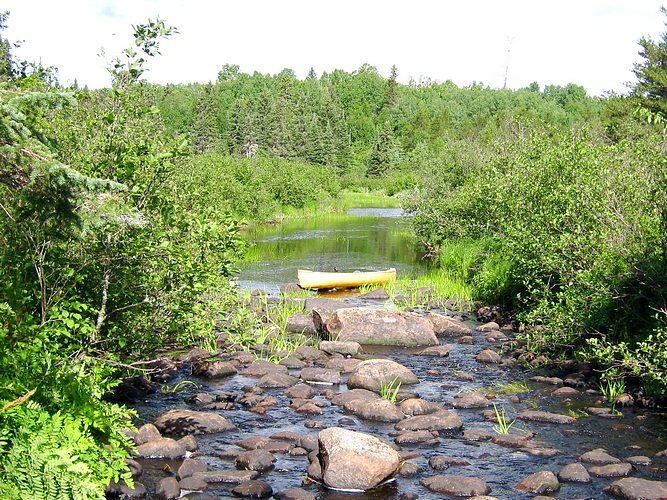 I turned it off when I reached a portage and back on when I had reloaded the canoe and was ready to resume paddling. This segment from the put-in to the MRSEP was about 5 miles but took me almost 3.5 hrs.--less then 1.5 mph. But now I hoped that at least there were portage trails and that the area would be a little more traveled. Experiencing total undisturbed wilderness was great but I needed to get to a campsite. The rest of the day's travel was easy. About 5 miles of travel including 2 60 r. portages. I paddled Big Moose Lake toward the southern-most campsite with a tailwind. It was a good campsite that showed some use. 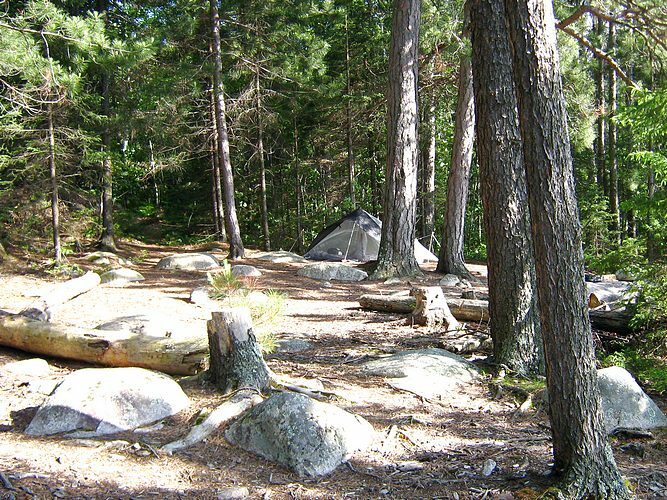 It had 2 or 3 tent sites, a large fireplace with a nice warming shelf and log benches. I covered the last 5-mi. in about 2.5 hrs. counting my lunch break. So I ended the day covering about 10 mi. in about 6 hrs. Not a speed record but I had seen it all--rough wilderness, small river and then a large lake which I seemed to have all to myself. 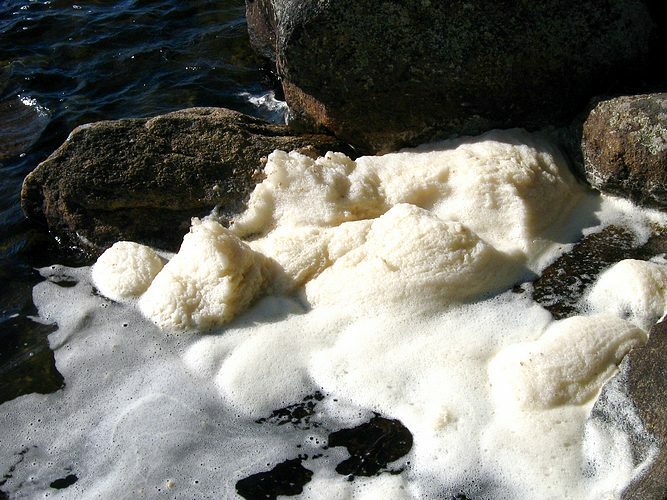 The wind was blowing from the west right into my campsite, foam was piling up along the shore and sometimes actually blew into the campsite like a tumbleweed. Click here for the next day.